A Federal District Court in Manhattan ruled today that John Jet, 44, was unfit to be a Patek Philippe watch owner. Patek, it's a contract. Photo from Patek Philippe. Citing the testimony of Mr. Jet's close friend, Raymond Roll, and the Firth Avenue authorized dealer from whom Mr. Jet purchased his Patek Philippe Calatrava, reference number 3893, Judge Harry Hammond said, "Not only did Mr. Jet not care for his Patek in the usual and customary way, but he also subjected his watch to unnecessarily risky and dangerous environments." During the six-day trial, Mr. Roll, testified under oath that on several weekends, Mr. Jet wore his Calatrava while playing softball and touch football. Mr. Jet's attorney, Nancy Nagal, tried to shake Raymond Roll's testimony by suggesting that it was actually a Fossil watch that Mr. Jet had been wearing. When asked by Ms. Nagal "When was the last time you had your vision checked?" Mr. Roll pulled back his sleeve, pointed to his white gold A. Lange & Sohne Lange 1 Soiree, and snapped, "I can tell the difference between a Patek and a Fossil." The testimony of Mr. Jet’s authorized dealer was particularly damaging. Mr. Jet bought his Calatrava in 2005. When asked if Mr. Jet had ever brought his watch in for servicing, Mary Maureen, the Patek Philippe authorized dealer, simply said, "No. Not ever." Mr. Jet’s attorney did not present any evidence that he had brought the watch into any other dealer since purchasing it. 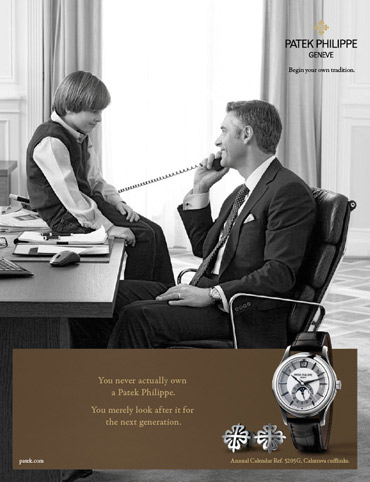 Noting the contractual relationship between a Patek owner and Patek Philippe, Judge Hammond quoted the obligation agreed to by every Patek owner: "You never actually own a Patek Philippe. You merely look after it for the next generation." Judge Hammond, who wears a platinum Breguet Hora Mundi World Time, found Mr. Jet guilty on two counts. In the judge's words: "John Jet should never have played sports while wearing his Patek Philippe Calatrava. He's a smart guy, a senior stockbroker. Mr. Jet should also have had the common sense to bring his Patek in for servicing at least once every five years. "If it was within my power, I'd bar this man from ever wearing a watch again. His acts were heinous, cruel and utterly devoid of morality. I find John Jet guilty of the crimes of willful endangerment of a watch, and watch neglect." Mr. Jet was sentenced to nine months in prison and three years’ probation, during which time he will be allowed to wear only quartz watches. His Calatrava was confiscated and will be auctioned for charity. Mr. Jet stood stoic-faced when the judge said that he would be in prison, but broke out in tears when he heard the words "quartz watch."